Despite the best efforts of groundsman Paul Jackson, all Tynemouth’s home fixtures over the weekend fell victim to the deluge last Friday night. Only the first team’s Premier League fixture over the river at Gateshead Fell survived. There, the travellers elected to bat first, even though conditions were not too conducive to healthy batting. Skipper Ben Debnam was bowled by Adam Watley for two with the score only ten. Tynemouth then quickly lost Stuart Poynter for eight and opener Nick Armstrong for 12 to see them struggling at 23-3. With the loss of Matt Brown for only two and the score on 31-4, Tynemouth were in trouble. However, a useful combination of 19 from top scorer Chris Fairley and 14 off the bat of Tahir Khan gained some respectability. Wickets kept tumbling and only 15 from Finn Lonnberg batting down at nine took the score to 99 all out. Whatley took 4-26 off his 11 overs with two wickets each for Jonathan Roseby and Cameron Oliver as the Fell took good advantage of the difficult conditions. When it was Tynemouth’s turn to field, Lonnberg took instant revenge by dismissing the top three and then number five, main threat Malik Javed, to see the hosts in an even worse start to the Tynemouth opening at 25-4. Whatley batted on for 28 but when he was dismissed at 68-6 the heart had been torn from the Fell’s line-up and Khan took firm control with four wickets and the hosts slumped to 84 all out. At the change this had seemed an unlikely victory for Tynemouth, but maximum points and an early finish was an excellent conclusion. Lonnberg recorded 4-20 off seven overs and Khan 4-21 off 10.1 in the clean up operation. Brown’s tight keeping saw only three leg byes pass him as he took a good stumping and a catch. On Thursday, May 5, the second team host Hylton at 6pm in the Roseworth Trophy. 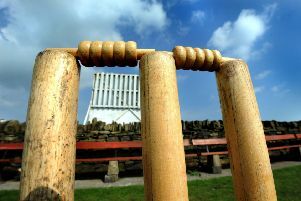 On Saturday the firsts are at home to Durham Academy and the thirds travel to Embleton in the Northumberland League. On Sunday the Academy team travel to Washington, and on Monday the U15s host Percy Main. The refurbished Tynemouth pavilion has now doubled up as a refuge for the players and a superb venue which may be hired for private functions.